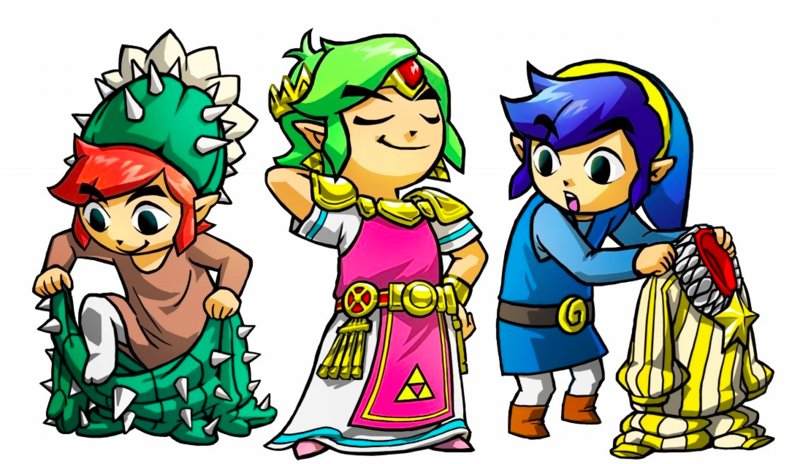 With the launch of Tri Force Heroes just two weeks away, it seems as if the upcoming Zelda game is all anyone can talk about! 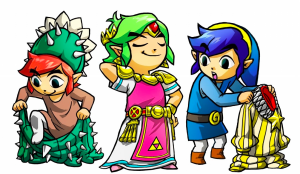 We have been seeing so much Tri Force Heroes news as of late, that the anticipation might soon drive us all Cucco! Now we have learned that in a recent interview with the Japanese website 4Gamer, Eiji Aonuma and Hiromasa Shikata have shared some new news about an exclusive custom that is only available through local gameplay. According to the pair they wanted to reward those that were playing the game locally with friends, so they decided to offer a special item called “proof of friendship”. The item will be awarded for each friend you play with locally. The collected items can then be combined to create a very special costume, however at this time it is unknown how many “proof of friendship’s” you will need to create the new costume. Head on past the break to check out a translated excerpt from the interview. 4Gamer: I’ll change the subject a bit, but please tell me about a matter that is on my mind. You need items called “proof of friendship” in creating a special costume, but can you get those in single player? Shikata: You get them only if you play together with other people locally or with Download Play. Aonuma: Generally speaking, you’d want to play the multiplayer. This time everyone can play with just one copy of the game via Download Play as long as you have three systems. Playing noisily with other people is the greatest flavor of this Zelda and you’d want to experience it. I think it can be hard to gather people if you’re an adult, but I’d like people to try to come and play together in order to collect proofs of friendship. 4Gamer: To confirm: you don’t get proof of friendship when playing online? Shikata: That’s true. You don’t get them when playing online. 4Gamer: It seems like it is good to have a reward for people who gather together and experience the local play. Aonuma: Yes. Be sure to invite friends and play together. Stay tuned for more details of this special new costume! What do you think, will you be trying to play locally? Tell us your thoughts in the comments below.